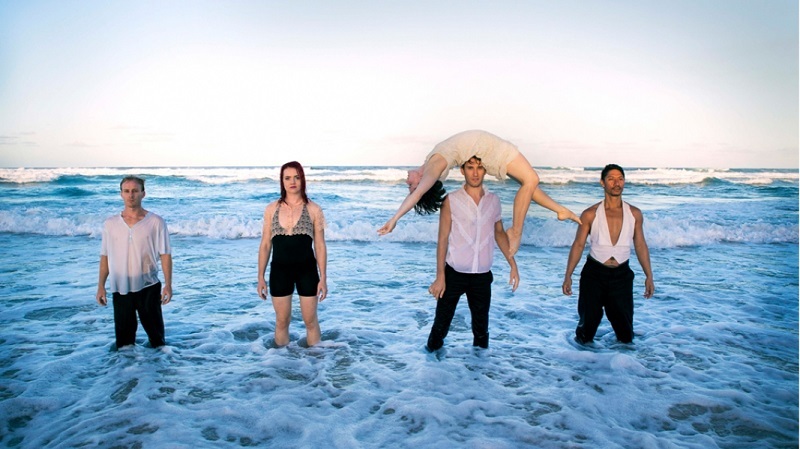 Australian circus troupe Casus return to London with their latest show Driftwood, a no frills/many thrills study of human relationships and connection. Knee Deep, the 2012 predecessor to Driftwood, gave Casus an international standing and led to that award-winning show being performed on different sides of the planet simultaneously. That’s not bad for a debut outing revolving around an abstract theme of human fragility and strength and where the most memorable prop was a tray of fresh eggs. We’re not exactly talking Cirque du So-so here. This time around, the topic has changed to human connections but all the old Casus motifs are here. This is definitely a no frills/many thrills experience: there are only five acrobats, no live band and the only major non-circus props are a hat stand and a small red light which is lowered and raised over the middle of the stage. Instead, the focus here is on the artists’ bodies and the phenomenal shapes they create. The various physical vignettes are well-executed and make frenetic use of this talented crew’s multiple talents from doubles trapeze to hula hooping to tumbling. The acrobalance is particularly excellent with Sarah McDougall often at the centre of some breathtaking sequences. Shannon Vitali’s aerial routine which combined hoop with single strap is both fresh and fun and a joy to watch. The music and lighting are on the sombre side of things which gives an atmospheric ambience to the more dreamlike episodes. Even in this tent seating hundreds, this technique focuses the audience’s attention on a space little bigger than a few square feet producing a hypnotic effect. Sucking all the attention in the room into such a small area is a double-edged sword which enhances the quality (or lack thereof) of what is being displayed. In most cases this works to Casus’s advantage and adds a creative frisson to relish. The theme doesn’t always hang together and is occasionally too opaquely delivered, especially in the parts of the show with lackadaisical choreography, but there is enough here for any circus fan to get their teeth into. Driftwood by Casus. Underbelly Festival, Paradiso Spiegeltent, Jubilee Gardens, Belvedere Rd, Lambeth, London SE1 8XX. From £15.50. Until 4 June.